Perfect family vacation cottage: This cottage has one of the largest decks you will find in the area. Resort offers 2 pools and 3 hot tubs (1 pool/hot tub is a 2 min walk), tennis, park, mini golf, lake recreation, beach and much more. No need to leave. Just relax and enjoy the views, activities and more. We invite you and your family to vacation at one of the most beautiful and diverse regions in North America, the Okanagan Valley in British Columbia, Canada. 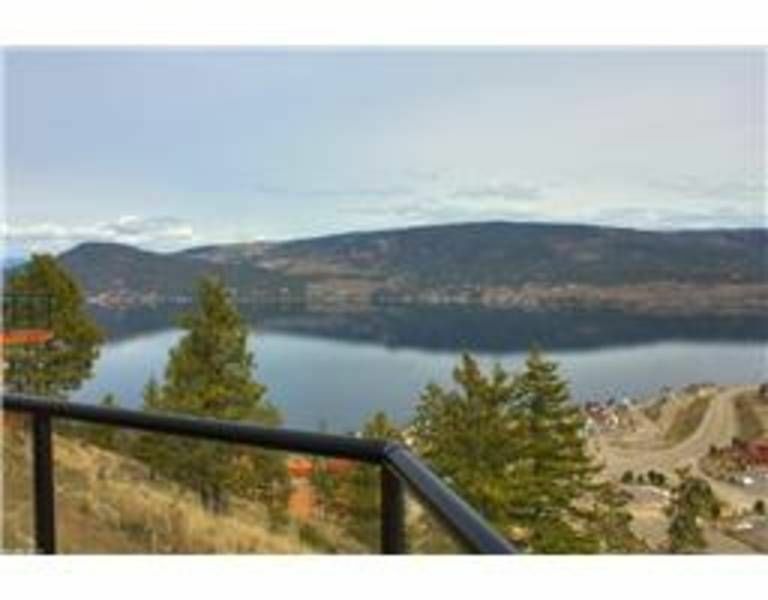 The cottage is perfectly positioned on Lake Okanagan to offer the best of what Kelowna and surrounding areas have to offer, but is remote enough that you feel off the beaten path so you can relax and unwind. Within a gated community, La Casa resort, this inviting cottage sleeps 4-8 people and is designed to have everything you need for your stay. Unobstructed breathtaking panoramic views of Lake Okanagan and the LaCasa Resort will leave you never wanting to leave this vacation spot. Generously proportioned rooms and a modern open floor plan make coming together easy so family and friends can join together to create those precious vacation memories. La Casa resort: The La Casa resort and surrounding areas offer various activities for the couple or the whole family. Onsite, you can enjoy the refreshing outdoor swimming pool, hot tub and private beach area in addition to mini golf, volley ball, tennis courts and a well equipped play ground. The cottage allows you to connect to the most popular activities in the region, including Winery and Vineyard Tours, Fine Dining, Boating and Watersports, Hiking, Biking, Climbing, Skiing, Offroading.....the list goes on. You choose what your vacation will include. Love the Okanagan valley and the location of resort. Enjoy the view! One of the best views of the lake/valley on resort. Big beautiful deck! Seasonal wi-fi offered - please specifically ask if required. In addition to the specific amenities noted with the rental of the property, the resort offers many additional amenities. Loved our stay at La Casa - it was so relaxing - just what we needed! Beautiful view !! La Casa is a wonderful place for a vacation. Cottage was great & contained all appliances & tools we needed. View is magnificent. We enjoyed the deck every day. Neighbors were friendly also. We had a very relaxing vacation! We spent the weekend at Jarrod's cottage for a girl's weekend. The view was spectacular and the accommodations very comfortable for 6 people. Features that I was pleasantly surprised with: 1) The extra blankets and pillows that were provided (so often this is not the case at other locations). As someone that is always cold, this was a definite plus for me. 2) The way the kitchen was outfitted. Certainly lots of pots, dishes, cooking supplies provided. We were never left wishing we had something. ..and the kitchen had a lovely large table to sit at. 3) The main beds were very comfortable. 4) The quiet nature of the complex. 5) The amenities offered at the complex. 6) Jarrod's responsiveness to questions. Thank you Jarrod, it was lovely. The only word of caution I would have for future guests: this location is a fair drive away from the heart of Kelowna and the airport. This made transportation a challenge for our group as Ubers did not service the area. If you are looking to find a more remote location and have your own vehicle, then this is the place to be, but if you think you will be wanting to spend time in Kelowna or will have troubles getting to/from the airport, you need to be aware of it's distance out of town. Incredible location, view, outstanding kitchen! We had a family wedding just down the road and other families staying at La Casa, so dinners were 19 + people. Great quality pots, lots of baking (lasagna type) glass cookware. Lots of plates - still brought paper plates, and we did bring extra cutlery, but there is at least 8 place settings of dishes. There was LOTs of room to have everyone inside and the deck is massive! Awesome glassware collection, loved that the beer mugs were in the freezer! - great for the water drinkers too! Filters for the coffee maker, need to bring COFFEE (we did). Salt and Pepper were in the kitchen. Had to hunt around for the pillows for the patio furniture (upstairs bedroom closets) - but when found really added to the enjoyment of the place. Rag's under the sink to be able to clean off the patio table dust, and rails for more enjoyment. Dish soap and dishwasher included in the property. Had to find the correct code for the gate ... a few numbers were out of sequence in the email sent - but no problem to either wait for someone else to open, or go to the guest services center. (we had someone behind our car that had a fob, and we found out the right number sequence). The pools are heated, so lots of enjoyment for kids and adults. Loved the property and location for the wedding. Great house, we really enjoyed our stay! Wonderful experience. Would absolutely recommend. Had visitors from Europe. They were amazed at the beautiful surroundings and stunning scenery as well as the comfortable cottage. We thoroughly enjoyed our stay. Would return to this unit. Bbq was having an issue, owner sent someone to make repairs within a day. Very happy! Thanks for the kind review. Visit again anytime.